Bruce and Will talk about the challenge of helping parents understand the new context for school and work. After debating for a bit about how much responsibility the school should take for this work, they agree that school’s must play a role in educating parents and communities about the changing contexts. This show starts out discussing three articles from Pew Research, The New Yorker, and The New York Times that help us to see and define the modern context and the importance of understanding it. At one point Will points out the gap between the cost of college and the cost of information, and because the gap is so large, people are opting for alternative paths to acquiring skills. More people are acquiring micro-credentials and badges to signal they have a set of skills. Check out the links to better understand what they were discussing. In regards to how school’s can begin embracing the modern context, Will and Bruce have some great advice. They discuss the importance of crafting a modern vision that is informed and shaped for the modern world. Once the vision is crafted, practices will need to be adjusted to meet the vision. They encourage people to use a range of media. Books and newsletters are not enough. Social media, technology, and face to face conversations cannot be ignored. The communication of the vision and the implementation of modern practices needs to be slowly dripped to parents and community members, so they start to see something different. As they see different, different will become the expectation, and change will occur. The need to move to a modern learning environment is necessary if schools want to be relevant. If schools want to serve our learners in the most relevant way, we must work to understand the modern contexts our children will live and work. Preparing them for that begins with our own learning. 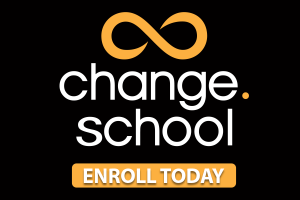 Enrollment for Change.School is open. Definitely, check it out. We’d love to have you join us.